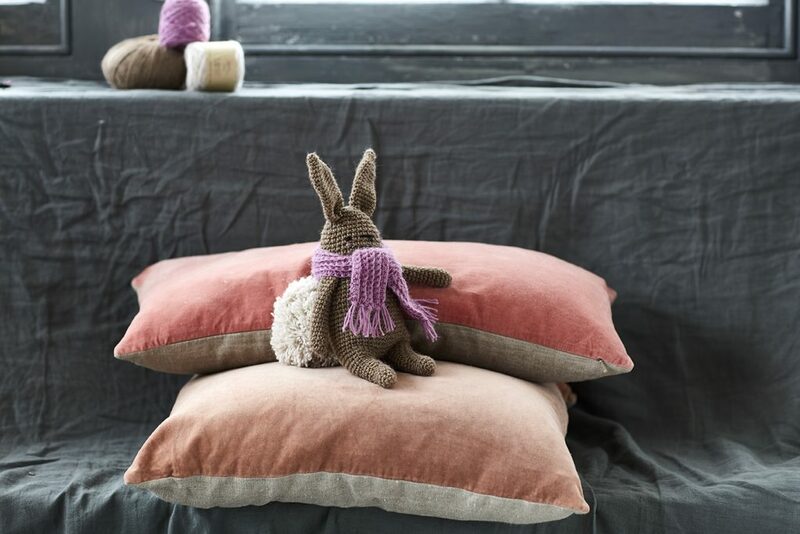 Home › Kits › Hello Lopsy Bunny! Many of you will remember the Toy Competition we hosted last January. This week we are very pleased to present our winner: Lopsy Rabbit! With big, floppy ears and an oversized pom-pom tail, Lopsy melts all our hearts. Available exclusively as a kit, we’ve bundled together all the yarn you’ll need plus the pattern, ready for you to make a Lopsy in your choice of two colourways. We chatted with the designer, Thandi Pritchard, about how Lopsy came to be and what she likes to make this time of year — be sure to read to the end to find out how you can win a Lopsy kit in the colourway of your choice! Did you always know you wanted to be a designer? Tell us about your crafting journey. Yes! I definitely always knew I wanted to do something creative. My mom loves sewing and crafts, I get my creativity from her. She taught me how to sew & I started out making bags. When I was a bit older my aunt taught me how to crochet granny squares and thats where my passion for crochet started! What do you do outside of designing? I work as a footwear & accessories designer, so designing fills every minute of my day! We’d love to know where the inspiration for Lopsy came from. Was it your first idea or did you go through different iterations? When I first heard about designing for Loop I was sitting in a coffee shop down the road from the shop. I always feel so inspired by all the colourful yarns and quirkiness of the store. I immediately started sketching ideas but in the end I decided on Lopsy Rabbit because I loved the idea of making an oversized fluffy tail and big ears, I just thought it looked super cute and everyone would enjoy making it. We think Lopsy is the perfect and most adorable gift for the holidays! What is your favourite thing to make as gifts? Thank you! I love making gifts for my friends & family. My favourite things to make are crocheted animals. Almost all of my friends have some kind of critter, whether they like it or not :) I’ve made everything from foxes and sheep to sloths and penguins. At the moment I am crocheting Christmas decorations as gifts and for myself. And finally, when the gift-giving season is over and the presents are all unwrapped, what’s your ideal project to curl up with and make for yourself? I love making handbags and cozy jumpers for myself. This summer I started crocheting bags out of raffia and for the chillier months I’m making some chunky wool versions. I’ll also continue filling my apartment with crochet animals, unfortunately for my flatmates. I recently did a punch needle workshop at Loop with Bookhou so I’d love explore more projects with this craft. Lopsy Rabbit kits now available! Just in time for the gift-giving season, this adorable critter is available as a crochet kit — with his big Orkney Angora pompom tail and made in very good quality organic wool from Denmark, one of our favourite standby yarns – bc garn Semilla DK. Available in two colourways, it makes the perfect present for a crocheter, or make one of your own! The pattern is not currently available separately. A big thank you to Thandi for taking the time to answer our questions! 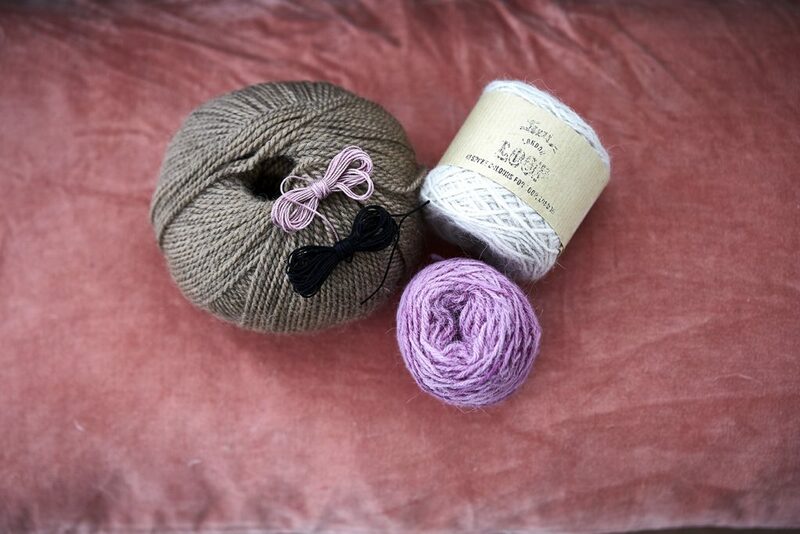 We love Lopsy so much, we’ve decided to give one lucky reader a kit in the colour of their choice! 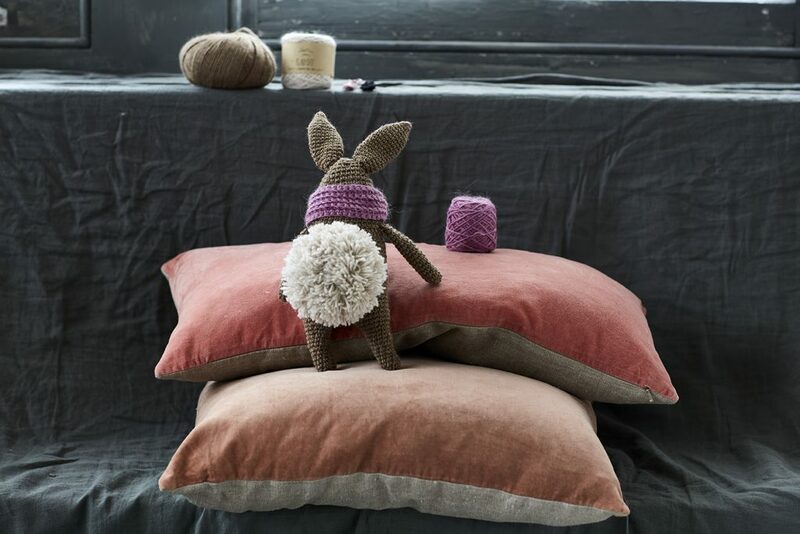 To enter, leave a comment on this post telling us which colour is your favourite and for whom you’d make this special bunny. To double your chances, enter through Instagram as well by following us @looplondonloves and either reposting our Lopsy post or posting an image of your own, using the hashtag #LoopLovesLopsy. Get your entry in by Wednesday, November 28th and we’ll announce the winner in next week’s blog post! ‹ Viola Weekend at Loop! I’d love a Lopsy bunny, the tail is so sweet. Love both colours but the heather reminds me of bluebells, in woods, where rabbits play around, so heather is my choice. Who for? Grown up daughter perhaps, who crochets hats, or a one year old great nephew, who normally just receives jumpers made by me. Love the lilac I would make it for my granddaughter! The one exclusive to Loop, natch! I love the lilac heather one! would like to make it for me and for my kid. OH I LOVE LOPSY BUNNY!!!! How wonderful! I love the lavender scarf and gray bunny! Congratulations Tricia, you’ve won! Please email the shop to claim your Lopsy kit. Oh Lopsy, the moment I saw you standing there with your fluffy tail and your floppy ears I knew it was love. Come in the Heather kit and you will find a beautiful home. I just love the lilac. Lopsy is such a quirky character! I would make him for my partner. Ghosts on pointe! Love that coral. I would make it for my best friend forever. She would love it! Heather Lopsy! Such a cute toy! I would make it for my Mom! love to make one with a lovely fluffy Coral tail as my retirement present to me! I would make the Ghosts on Pointe one – as it is your special bespoke colour and it would be my first ever crochet project for my newborn daughter (currently 3 months old). I like the heather kit most – both are lovely. It would be a gift for Florence my granddaughter. Its not often I see a crochet creature that I would like to make (I’m not good at wee things) but my 7 year old son would love her in Ghosts on Pointe (as would I!). He might pretend that he is all grown up but he absolutely loves a cute creature, and I him. Loving Ghosts on Pointe. However I don’t think I could part with Lopsy once finished so would have to be selfish and make him for myself. Absolutely adorable! I’d make a Heather Lopsy, but I might have to keep him at home! That is just so sweet! I would pick the brown bunny and she would sit on the couch for everyone to enjoy and love. Sweet! I love the Heather Lopsy for my Mom! I would choose Ghosts on Pointe, as that is your bespoke colour and it’s fun. I would crochet it for my new daughter who is 3 months, as my first ever crochet project. (Baptism by fire!). Flopsy is so lovely I love the Heather colourway. I would make it for my daughter. Love the coral one!It would be perfect for my newborn niece! I love both but prefer ghosts on pointe. I think if I make it it can’t leave our house because unicorns and dragons don’t want to let it go. So amazing! I would choose Ghost on Point with the coral scarf and would make this for my niece! So adorable. I would make it for my son. He had a bunny, Brave, from his childhood that we bought when we were at the children’s hospital when he had to see a specialist. It has fallen apart. Now my son is soon off to university next fall and I want to make him a little bunny for his dorm room. Love the Heather Lopsy! I would make one for my Mom! My daughter loves the Ghosts on pointe best, so that’s my choice! 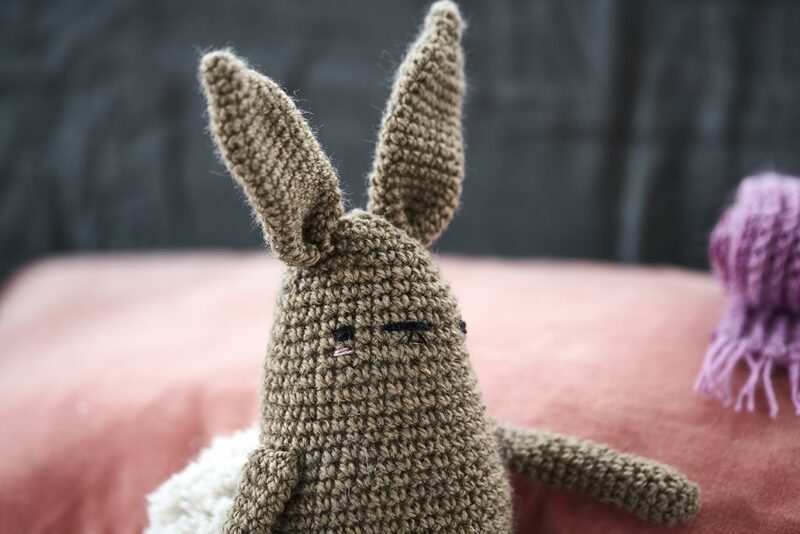 I really love this bunny, particularly the heather colour, and I would make it for my daughter, who whilst having quite a collection has always got space for one more. It would be very hard to choose. I just love Lopsy and would make him for my granddaughter Celeste. I love both, adorable Heather, adorable Ghost…. I would make it for me, myself and I…. We bought my son a bunny at the gift shop when he was in the hospital years ago. The poor bunny is in need of desperate repair. We just finished uni applications and I would love to make him a bunny to take away to school. Ghost on Point with coral scarf is nice! I love the lilac one. I would make it for my darling granddaughter. I would love to make this gorgeous Lopsy Rabbit for my baby grandson Magnus in colourway Ghosts on Pointe.